Matru Ki Bijlee Ka Mandola is an upcoming comedy-drama by notable filmmaker Vishal Bhardwaj, who is known for making bold and relevant films. 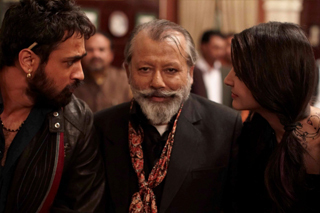 The film will see actors Imran Khan and Anushka Sharma pairing up for the first time in their careers, and also stars Pankaj Kapur and Shabana Azmi in supporting roles. It is all set for release in cinemas worldwide on 11 January 2013 and is being referred to by segments of the media as one of the key films to look out for next year. According to its synopsis, the film is set in a village in Haryana, where Bijlee (Anushka) is set to marry Baadal (Aarya Babbar), who is the son of the powerful politician Chaudhari Devi (Shabana). However, Bijlee and her industrialist father Harry Mandola’s (Pankaj) affiliation with Matru (Imran) make the arrangement of this marriage difficult. This results in various twists and turns that will leave you guessing how the film will reach its ultimate climax. The music to the film has been composed by Vishal Bhardwaj himself, who has composed the soundtracks to his previously directed and produced films also. These include 7 Khoon Maaf (2011), Ishqiya (2010), Kaminey (2009) and Omkara (2006). The lyrics have been penned by the legendary Gulzar. He has not only written the lyrics for many of Bhardwaj’s films, but also other recent films like the late Yash Chopra’s final directorial Jab Tak Hai Jaan (2012). So let’s take a look and see what Matru Ki Bijlee Ka Mandola has to offer to us Bollywood lovers! To start off, we have the film’s title song Matru Ki Bijlee Ka Mandola, performed largely by Sukhwinder Singh, with Ranjit Barot providing back-up vocals. The song has a unique feel to it and is certainly very different compared to what we have been hearing recently in Hindi film soundtracks. Sukhwinder is as amazing as ever and his vocals are strong and full of energy, which complements well with the music composition. Overall, Bhardwaj got it right with this one and I am sure that this song will grow in popularity and acquire the attention which it deserves. Next we have Oye Boy Charlie, which is performed by Rekha Bhardwaj, Mohit Chauhan and Shankar Mahadevan. The composition has an intense desi feel and style to it and you can hear instruments such as the tabla and the harmonium being played. I am a huge patron of classical Indian music, so anytime such related instruments are incorporated into a Bollywood song, I get musically excited! It is apparent that a good amount of effort has been put into this song in order to ensure that it appeals with the masses. The hard work certainly paid off and I think this song is one of the highlights of the soundtrack. The vocals are top notch and Rekha’s voice especially adds to its general charisma. Definitely not a song that I would skip! We also have Khamakha, which is sung by Vishal Bhardwaj and Prem Dehati. You can clearly hear African influences included in this song, which gives it a distinctive edge. However, I find it to be very average and would not classify it as one of the great mellow tunes to have emerged from Hindi film music. With more work, perhaps it could have been better, but I found it to be an unfulfilling song. There is also a short track with strong African flavours titled Nomvula, which features Umoja. Despite the track being brief, it does spark your interest and reminds you of the kind of music that was used for Disney’s The Lion King. Do check it out, as you may find it intriguing to listen to. Following this, we have Lootnewale, sung by Sukhwinder Singh and Master Saleem. The music has a strong bhangra concept to it. This is apparent when you hear instruments like the dhol drums, which is strongly present in the song. Yet I found it to be somewhat odd and Bhardwaj just went over the top when it came to executing his instruments in this song. Although Sukhwinder Singh delivered a good vocal performance, it unfortunately just did not work for me. There is also a short reprise version of this song in the soundtrack, which is a bit dismal in my opinion. However, given its length, I am to an extent certain that it is for the use of a particular scene in the film. Next up we have Badal Uthiya, performed by the lovely Rekha Bhardwaj. I love the classical elements of this song and there is the strong use of the sitar, a nice change of instrument in my view. Rekha sings this song very melodiously and the music in general has a desi zing to it which definitely grabbed my attention. As with Lootnewale, there is also a reprise version of Badal Uthiya, which is sung by Prem Dehati. This version does not really appeal to me and I would recommend that you skip it, as Prem’s vocals do not match well with the general tone of the composition. Hence, Rekha’s version is much better and is undoubtedly another highpoint of the soundtrack which you should not miss out on hearing! There is also Chaar Dina Ki, which is performed by Prem Dehati, with Pankaj Kapur and Imran Khan providing some short dialogues. This track only lasts for two minutes and it contains music which you would hear from a marching band at a desi wedding. I can assure you that there is no real allure with this song and it may have been composed merely for the use in a particular scene or situation within the film. Definitely one track which you can skip with confidence! In addition, there are some other short tracks in the album which I am presuming are for use within the film and thus cannot be regarded as a typical Bollywood film song. These include Shara-Rara-Ra, featuring Prem Dehati and Chor Police, with Pankaj Kapur. Trust me when I say that there is nothing fascinating about them, but may appeal to those who end up really, really enjoying the film and want to recall it through these tracks. To conclude with this review, I have to say that I am a little disappointed with the soundtrack to Matru Ki Bijlee Ka Mandola. Though there are some great tracks that you should not miss out on hearing, this is not one of Vishal Bhardwaj and Gulzar’s great works. Their previous albums such as Ishqiya and Omkara are without a doubt more flavorsome compared to this one. Having said this, I will say that the album did provide Rekha Bhardwaj with a good platform to reassure Bollywood fans that she is a very unique and talented singer, who thoroughly deserves the recognition she has attained over the past few years! The most memorable songs in this album are the title song ‘Matru Ki Bijlee Ka Mandola,’ ‘Oye Boy Charlie,’ and ‘Badal Uthiya’ (Rekha’s version). Perhaps the film will impress us more when it releases on 11 January 2013. As for the soundtrack, it is fruitless and weak in terms of its quality. Don’t listen to it with the presumption that it will be mind-blowingly fantastic!